My love affair with Rolex has always been on and off. There are times where I think that I would like to get one and yet there are times that I feel why should I. I have a Rolex, a GMT Master from 1964 that my dad handed down to me. This watch is in great condition as it goes back to Rolex for a service once every 5 years, regardless if it is worn or not. I recently had it serviced and it is now officially 'retired'. I guess my need to get one stem from the fact that as the years go by, parts are becoming more and more difficult to get. I know that there are some people who like to keep their Rolex in its 'as is' condition. That is why the Rolex that I have, has been 'retired'. So I need to get a more current or 'modern' Rolex that I can use on a daily basis without having to worry if I could get a replacement acrylic crystal or the Pepsi bezel insert if it get scratched or damaged. So the question is which Rolex should I get, if I do get one. I guess it has always been either the Submariner or the Sea-Dweller. Or perhaps the new Sea-Dweller Deepsea. The question is do I really the depth rating of the Deepsea? Would I be happy with the Submariner? So I did a little research and look see. I don't really like the cyclops on the Submariner Date, reference 16610, so it is down to the non-date version. I have ruled out the Sea-Dweller as I don't really like the new Deepsea and the old Sea-Dweller, although is available, comes with a premium. Sigh. 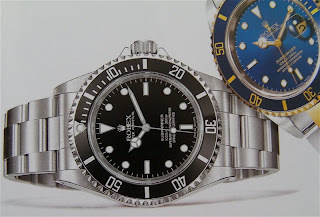 The non-date version of the Submariner would the the choice I guess. So I found out that the current model is reference 14060M. It looks good and is an interesting watch, if I decided to 'dive' in and get one. However, I decided to read and research more about the Submariner. I also had a look around at the shops here in Taiwan. This is were it all went wrong (or right). I found out that the current model, reference 14060M was introduced in 1999. Prior to that, it was the model reference 14060. The difference being the movement used. The 14060 is powered by Rolex calibre 3000, while the 14060M is powered by Rolex calibre 3130. I also found out that the popular non-date Submariner is the model reference 5513, which was produced between 1962 to 1990. This watch is fitted with the Rolex calibre 1520 or 1530. Herein lies the problem. Do I get the current model with the COSC certification and 'SUPERLATIVE CHRONOMETER OFFICIALLY CERTIFIED' on the dial or do I get a pre-loved one without the above markings on the dial? Or worst, do I look around and hunt for a 5513? I like a simple and clean dial, so I think the 14060 would be the one to get. However, I was told that there are 14060M without the COSC certification and writings on the dial but with the newer 3130 movement. True enough, I found a pre-loved K series non-date Submariner. This Submariner is from 2001, reference 14060M. Well all this are conjectures at the moment. The plus point of this exercise is that I am learning more about the brand and in particular the Submariner. So will I get the watch? Only time will tell. To complicate the matter, there could be a new Submariner this year. Note, the 5513 is rated to 660 ft. water resistant, while the 14060/ 14060M is rated to 1,000 ft.